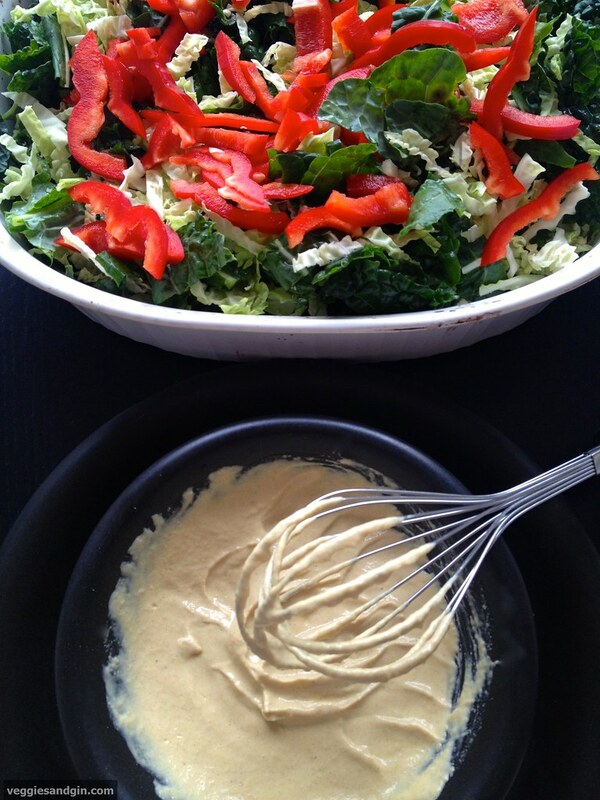 When I stopped eating dairy (chocolate and Roberta’s pizza do not count), tahini-based dressings came to the fore. The tahini-Dijon dressing here, unsurprisingly, is the real star of this salad but this recipe also happily combines some of my other favorite ingredients: cabbage, kale, red bell peppers, cherry tomatoes, and sun-dried tomatoes. This makes a massive quantity of salad and can easily feed a crowd. As an added bonus, it keeps well and travels well, which makes it perfect for a picnic (picnic season, people) or a light healthy snack on the beach (or by the pool, what have you). Actually, the flavor improves the longer it sits so, if possible, prepare it a few hours ahead of time and then simply toss again before serving. You can also rest assured that the recipe is irritatingly packed with good-for-you ingredients. Cabbage, kale, tomatoes, and red bell peppers are all pretty self-explanatory. Raw apple cider vinegar is pretty incredible as a digestive aid; it acts as a prebiotic that promotes the growth of probiotics in your digestive system. When shopping, select one that is labeled "raw" and "unfiltered," or that still contains the "mother," which essentially means that it's unpasteurized and has its own enzymes and beneficial bacteria. Nutritional yeast is a complete protein and gives the salad dressing a deliciously salty taste so try not to leave it out. Hemp seeds, too, are an amazing source of protein. Sunflower seeds have an abundance of vitamin E, magnesium, and fiber. Basically, I looked out for you, friend. This recipe is also available on Food52. (I know - a recipe post within a recipe post. It's like the Inception of shameless self-promotion.). Grab your kale and get to work. Prepare the dressing by whisking all of the ingredients together. Season with salt to taste but note that the nutritional yeast alone can make the dressing quite salty. At this point, dress the shredded kale, cabbage, and bell pepper and let the salad sit for about 30 minutes. In the meantime, prepare the cherry tomatoes, sun-dried tomatoes, and other ingredients. Add both the cherry and sun-dried tomatoes to the salad and toss. Season to taste with sea salt and freshly cracked black pepper. I like an aggressive amount of black pepper. Top with the sunflower and hemp seeds. Serve immediately or cover and store in the fridge for later use. Are you planning your next picnic yet? You should be.